Do you want to carry art on your body, but not something as permanent as a tattoo? Fret not, now you can show your creativity through those beautiful long nails, which took you months to nurture and grow! 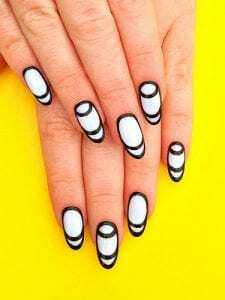 Nail art may appear cumbersome and time-consuming however, you can safely let that thought find its way out and try out these super easy, funky and fabulous nail art designs. Ditch the boring old monochrome paints and let the world get a glimpse of your artistic side! 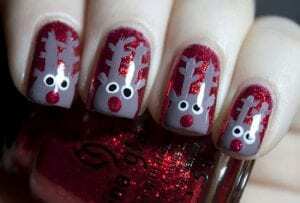 So here are 30 simple and unique nail art ideas and designs to look for. 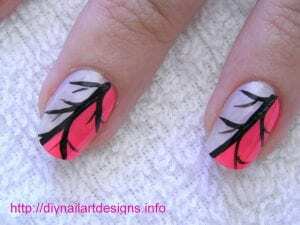 This chic design is super easy and the best part is that doesn’t need to be perfect! Choose any 2 of your favorite colors that go well together. Apply the base, let it dry, and then draw curves and dots as you want to. It couldn’t get any more easier than this, yet it looks cute and funky. 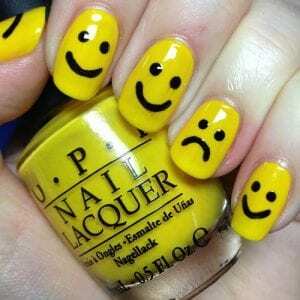 Apply the base paint as per your liking and then draw the smiley using the round end of a bobby pin. You could draw different expressions or the one which represents your present mood. 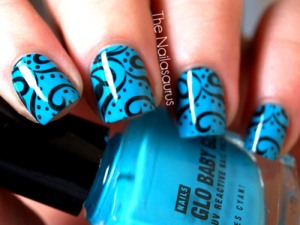 A small piece of tape helps you create loads of funky nail art designs. 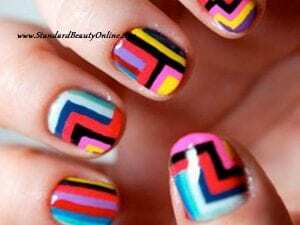 Put the base paint, cut the tape in a zigzag fashion and stick it over your nail. Apply a different polish and remove the tape when it dries off. These adorable eyes will take you less than 10 minutes to perfect. 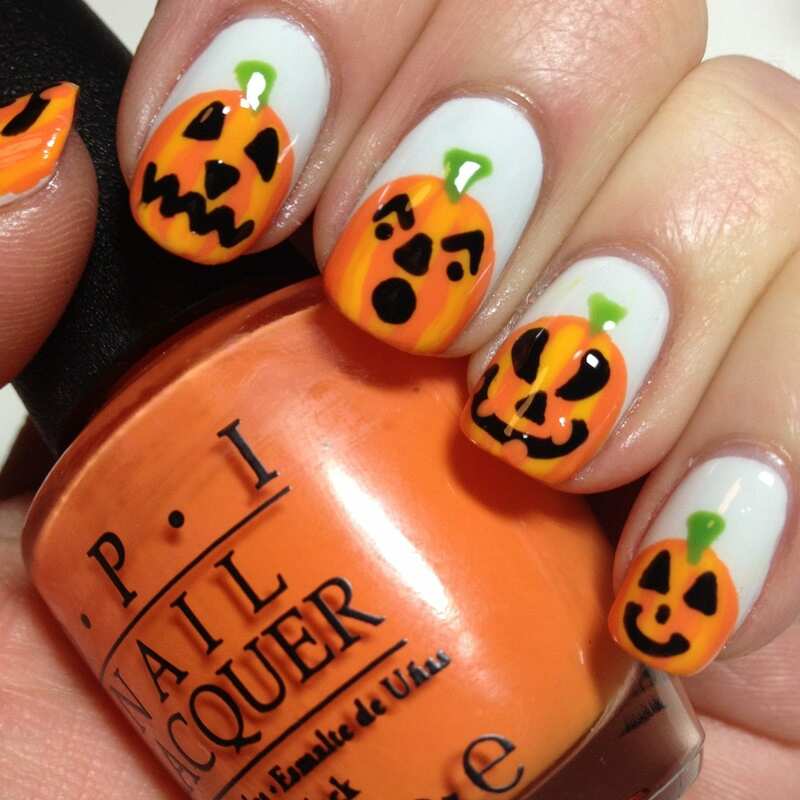 Paint your nails black, put white dots with the head of a pin, and then draw the eyeballs as you wish! Let these cuties look at different directions. 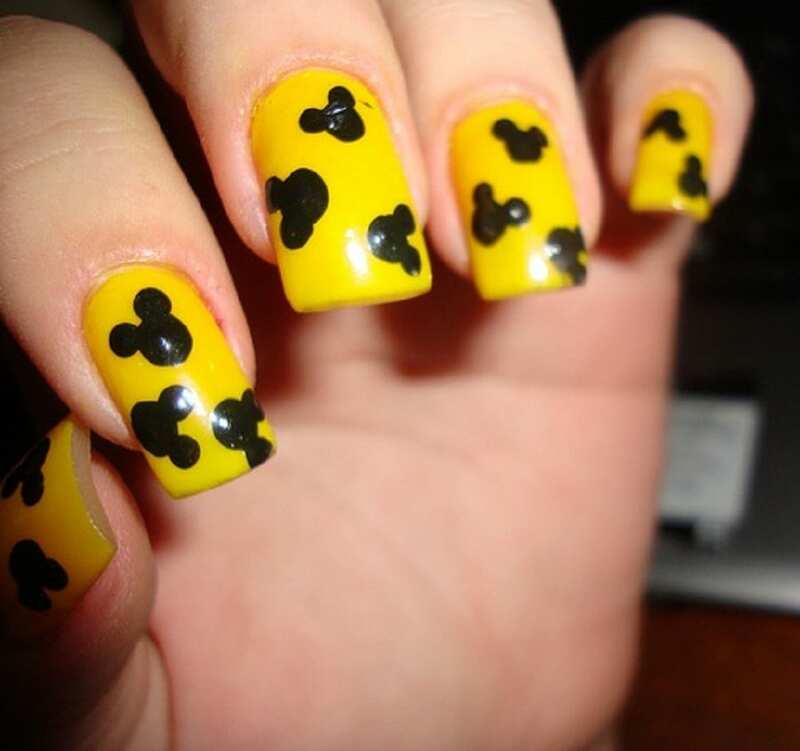 For all the Disney lovers, this is the perfect nail art for you. Paint your nails bright yellow. With the head of a pin put 3 dots close by. Join them to create the classic Mickey Mouse symbol. 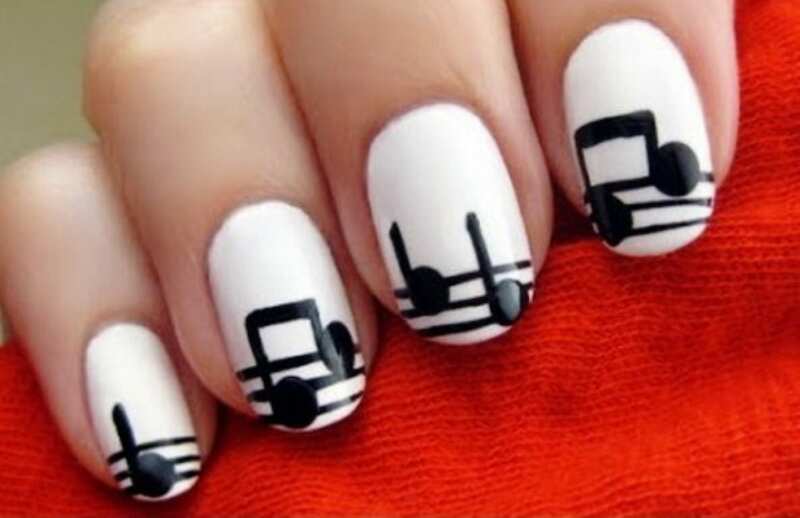 Music lovers, this is the design which truly reflect your personality and interest. All you need to do is, paint your nails white. Put 3 lines at the lower ends, and make the musical notes with black paint. Sometimes, keeping it simple is the key. These humble crosses give a different angle and vibrancy to your nails. Paint the base color, and make a cross. Use different shades to make more crosses to add liveliness. This design is a must try for those you want to add some color and freshness to their lives. Buy as many bright paints as you can and try out these doable patterns, which can never ever go wrong. 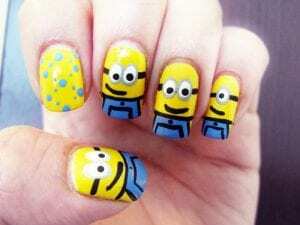 Nowadays, minion is getting immensely popular. No one can possibly hate this delectable evil- serving assistants! Highly fashionable and trendy, this design will definitely earn you a lot of compliments. Use a small tipped brush to do draw the intricacies. The dice is one of the most popular nail art design. 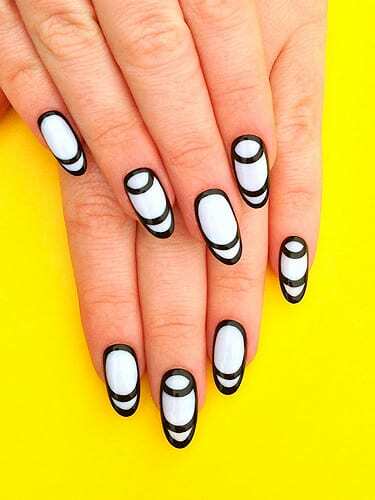 These are basically DIY dots alone, but with a twist. Making dots can be a little stressful and shaky, but using the round end of a bobby pin will do the trick. If nothing works out, you could always make flowers! One of the simplest nail art design, flowers make your nails look extremely feminine and gentle. All you need to do is use the blunt end of a pin and put dots. You could use different colors, or make different shapes too. The bow gives you a very non- fussy and formal look. This unique design will surely gain you a lot of attention! All you need to do is paint a transparent coat, then make the little bows with a pin. Glitter nail paints are available everywhere. Use tape to make diagonals and straight lines. 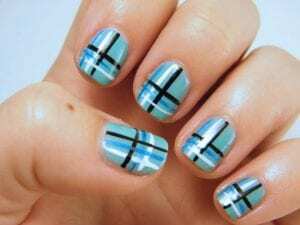 Fill the diagonals with glitter nail paint. Apply transparent paint in the upper region and sprinkle black glitter lightly, so that it gives a smoky effect. 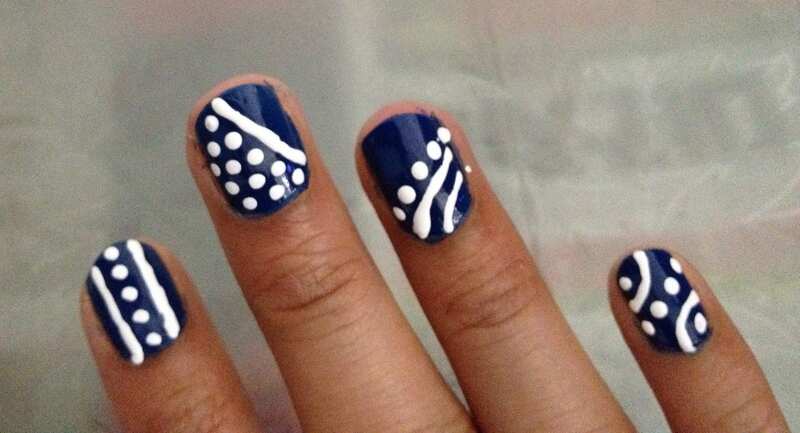 Polka dots are the least time consuming and look super attractive. Bobby pins and a dash of colourful nail paints are all you need. 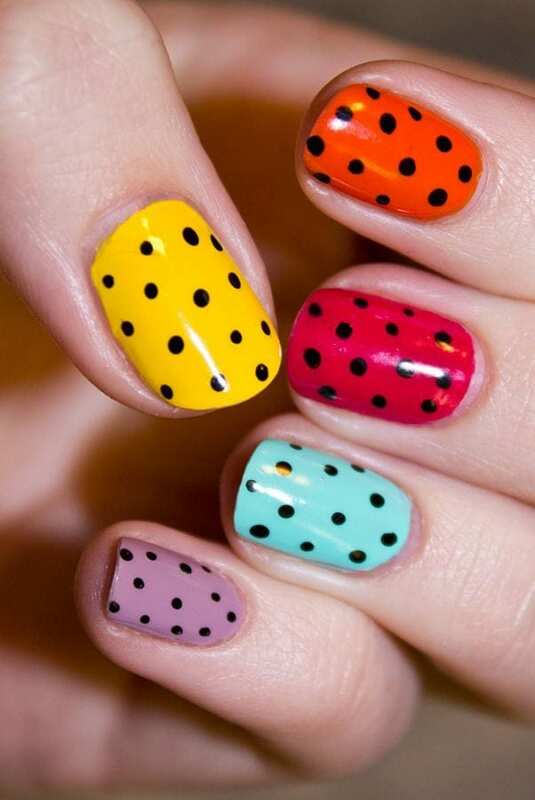 Colour your nails differently and apply the dots carefully. These look perfect when you are headed for a party. Outlining your nails is a very unique nail paint idea which looks spectacular. Firstly, paint your nails white. Then outline it with a blank paint. To make crescents, use reinforcement stickers, by sticking them on the top. After all, practice makes a man perfect! Scare your peeps out with this Halloween inspired pumpkin heads! It isn’t as difficult to make as it looks like. After applying the base coat, draw the crescent heads and stalk. Make scary expressions as you please. People who are into Goth will surely love this. Frankensteins make one of the best nail art designs. Paint your nails green and draw the hair, mouth and eyes with the blunt end of a pin. It can be messy too! It’s the perfect example of unity! When you place your nails together, they bring out a different meaning altogether. Paint your nails bright orange. 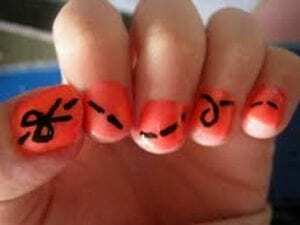 Draw a pair of scissors on your thumb nail, and consequent dots on the others. Whenever you have doubt, use glitter. 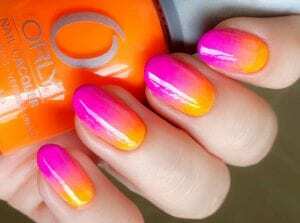 Paint a bright colored nail paint. 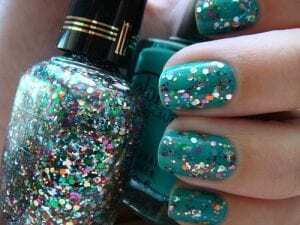 When applying the second coat, sprinkle glitter while it’s still dry. Glitter nails accentuate your look and add a glamor quotient, whenever you are headed for a night out or clubbing. This is easy to attain, with a little practice. Use the fabric that makes up loofah as a stencil. This fishnet looks highly sophisticated. Paint your nails and let it dry. 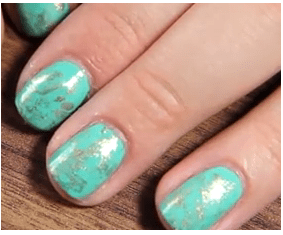 Hold a piece of loofah over your nails and paint another color. 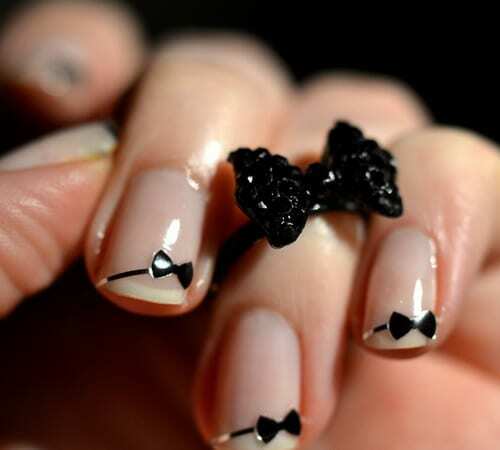 This nail paint will make you look prim and proper. Gives you a majestic look. Choose light colors which will bring out more effect. Cut the tape in different shapes and use that to get a clean shape. Reindeers and Christmas go hand in hand. Get in the festive mood and help yourself to these cute reindeer heads. Get a sparkly red polish and paint it. Then use a greyish paint to draw the heads. Lady bugs add an ‘aww’ factor to everything. These pretty red bugs are easy to draw and look very cute. You just need to perfect the art of applying dots. 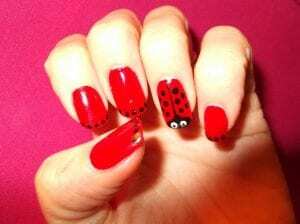 Draw the bug in one nail and keep the others simple. As the name suggests, you can use as many colors as you possess. All you need to do is, make diagonals, which can easily be done using tape. Make as many diagonals as you can and fill them with all the vibrant colors. This either resembles the branches of a tree or lightening, depending on what you perceive it. 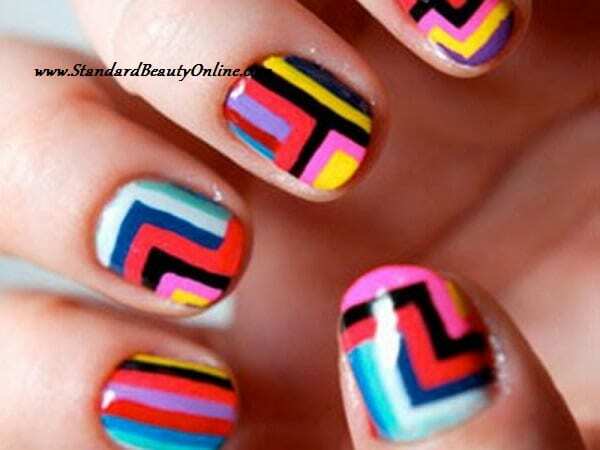 Divide your nail and paint each half with contrasting colors. Make the branches/ lightening as you want to and you will be all good! Could it get any easier and more fun than this? Cover the area around your nails with tape and apply the base coat, preferably white. 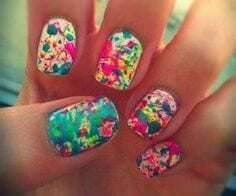 Now use straws to splatter different colors of nail paints on your nails haphazardly. Now it’s possible to get your nails to look exactly like pebbles and precious stones! Take a crumpled up ball of plastic, and paint a few portions of it with a metallic color. Pat it gently on your nails over the base coat. This artistic nail art design looks tiresome but isn’t. Apply a bright base coat to give weight to the design. 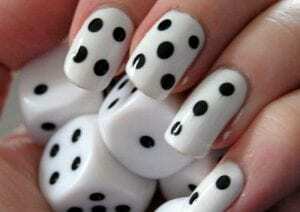 With the help of a bobby pin, make curves and dots all over your nails, with black paint. It is an eye-catcher. Yes, it’s possible, and without any professional help. Paint your nails the lighter color first. Put as many paints next to each other and swirl them at their meeting point with a toothpick. 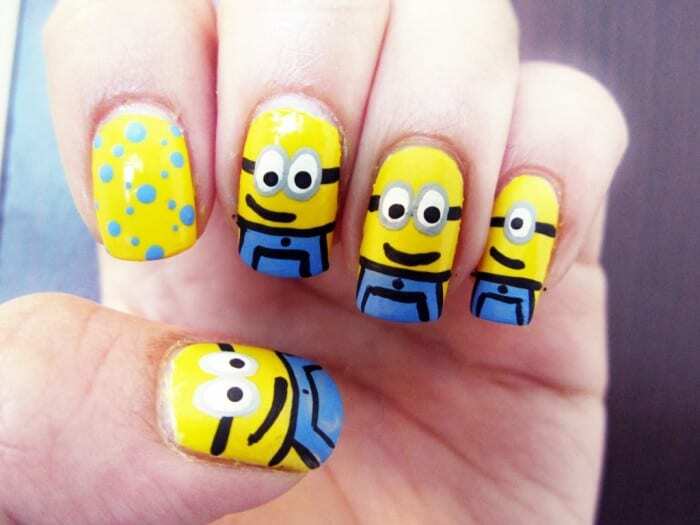 Dab the sponge onto it, and move it up and down slowly on your nail. To get these delicately thin striped nails, first put on the base color. 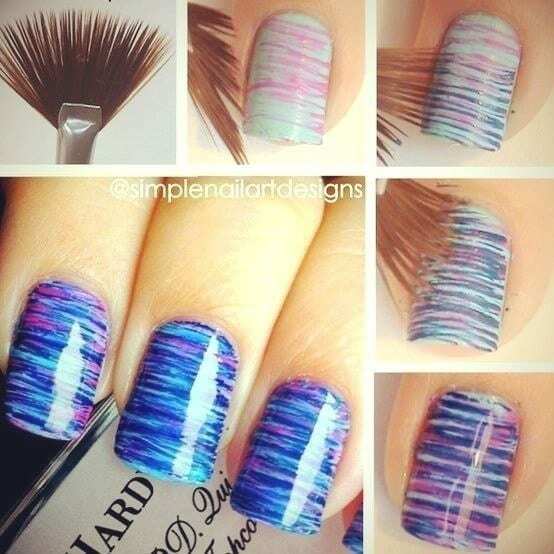 Dip the tips of a fan brush’s bristles in different colors and swipe horizontally over the nails. Try out different colors only after the previous one dries up. Do try out these unconventional designs and showcase your creative side to the world!